Hey everyone, it's Jenn here with the latest updates. Now that Summer is here, and the kids are beginning to get out of school, what are some of your favorite projects to work on? I'd love to know, feel free to leave me a comment either here, on twitter, Facebook or on YouTube at LoveMadeCrafts. I have begun filming my tutorial videos, and will be posting them as I get them finished and edited, so keep your eyes out on the Videos page for those! I also want to share with you all a little of my "underdog" story. For several years I attempted and re-attempted to make projects with the Catherine's Wheel Stitch. It's a very beautiful pattern, and had always eluded me. It caused me to throw my yarn on several occasions and eventually give up on ever succeeding at making it. Until a friend convinced me to try again. So I did... going into it expecting the same results that I've had all this time, and got the surprise of my life. 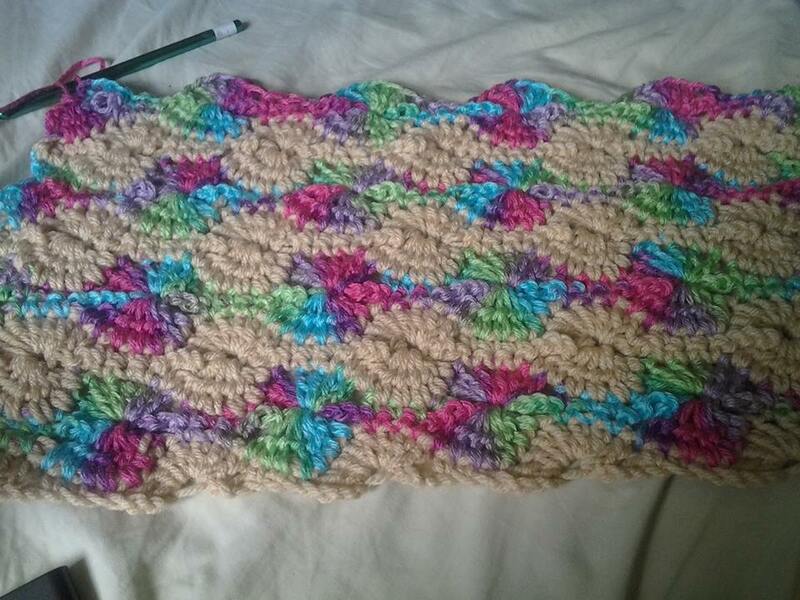 Not only did I manage to do the pattern, but IT MADE SENSE! That beautiful little lightbulb came on and made me and everything around me glow with knowledge! It's 6 hours later, and I'm still stoked! Below you'll find a picture of my WIP and a link to the video I watched to finally understand it, but the moral of this is DON'T GIVE UP!! It's okay to walk away for a little while, to take a break, to re-evaluate, but now I know... the only way to really fail at something is to stop trying. With that, I love you guys, and I always look forward to seeing your work in the Community Post sections. *Note* this video is property of The Crochet Crowd, I do not own any licenses or claim any rights to this video. It is shared in the interest of sharing knowledge only. Enjoy!